Image: thefancy.comOMG, people. I was alerted to this important and life-changing news this morning by my cakey BFF Bakerella: a unicorn-shaped sprinkle shaker exists. 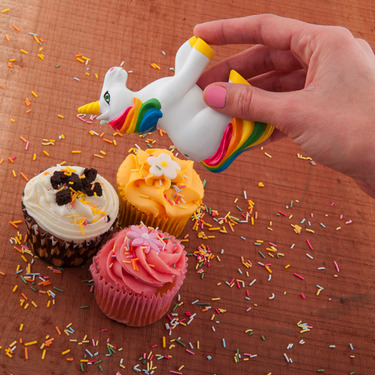 Shower your sweet treat with some sprinkles dusted by the fairytale-like Unicorn Sprinkles Shaker. Holes at the top of the unicorn's body release the sprinkles after you flip it upside down and shake. Multi-coloured sprinkles will scatter over your ice cream, cake or anything that you want to add a sugary and colourful taste to. The mythical unicorn will add a more mystical look to your kitchen as well as adding a magical taste to your food. I love this thing! The news of its existence, by the way, was broken to me in the most effective way possible: via twitter. Bakerella put it succinctly: "@cakespy," she said, "you must get this!". Truer words have never been spoken, because yes, I need this thing. And you do too. Here's the link to buy.